ATTRACTIVE AND EASY TO MAINTAIN - Foody towers add beauty to any home. Each plant is in its own net pot which makes planting and plant care very doable. AUTO-ROTATION - A synchronized rotational motor allows easy access to all plants and ensures maximum light exposure when the tower is placed near a large window or grow lights. AUTOMATIC WATERING - Innovative deep-water hydroponic system automatically circulates water and nutrients in each growing pod. A COMPLETE SYSTEM - Includes Nutrients, Total Dissolvable Salts Meter, pH Control Kit, and Rooting Plugs. FRESHNESS WITHIN REACH - Foody towers bring great, fresh tastes home every day of the year. 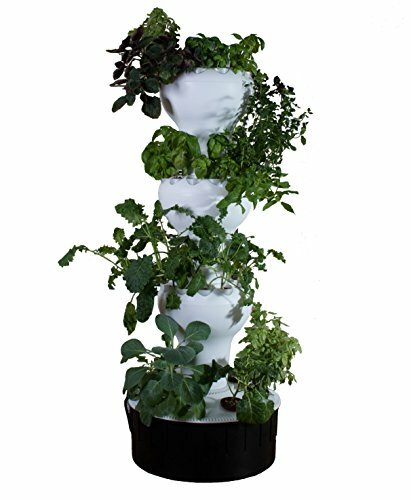 If you have any questions about this product by Foody Vertical Gardens, contact us by completing and submitting the form below. If you are looking for a specif part number, please include it with your message.